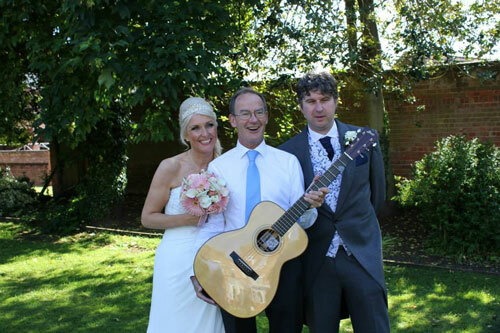 Add the perfect musical touch to your wedding day. Either as a welcome break for the children during the speeches, or as an integral part of reception entertainment for everyone where the children have a moment to celebrate in song and comedy! The Music Man can arrange a package of entertainment that includes other children entertainers for longer periods of time. It was a real pleasure to have you at our wedding, as you know these events can be quite stressful with the bringing together of family and friends that are important to you but that don't know each other and often with various family tensions going on in the background. Put children into the mix and it could quite easily be a recipe for disaster! We really wanted our day to be very special not only to us but also to our family and friends and we especially wanted it to be a family day with children included. Managing the balance took some considerable thought in the preparations for the day and your presence played a part. Indeed, you did us proud and as you will see from the photos, not only were you an absolute hit with the children but also with Stuart and I! The staff at Whatley Manor thought you were great as did our friends. I know that as a result of our wedding our friends Matthew and Lee wanted you at their wedding only a month later! We cannot thank you enough for helping our day to be so special, one that we were able to relax and enjoy and that all our friends and family are still talking about as 'the best wedding they have ever been to' many months after the event! With very best wishes and fond memories.